This week, the first Forest Academy for EU Decision Makers will be organized jointly by Finland and Sweden. Finnish Minister of Agriculture and Forestry Jari Leppä and his Swedish colleague Sven-Erik Bucht will speak on forest bioeconomy and the significance of forests in tackling climate change at a press conference held at the opening of the Forest Academy on Wednesday, 21 November in Finland. About thirty participants will gather to the first Forest Academy for EU Decision Makers, to discuss the role and potential of the sustainable use of forests in circular bioeconomy. The decision makers represent various EU institutions, such as the European Parliament and the European Commission, as well as business, research and education, NGO’s, media and the forest- and bioeconomy-related sectors. The programme introduces to the participants the entire value chain of the forest sector, from forest resources and sustainable forest management to the production of traditional and new goods and services. The programme also offers science-based analysis on how forest management and new innovations can help solve global challenges such as the climate change and urbanization, as well as awarding opportunities for sharing insights. The media is invited to attend the opening session of the Forest Academy on Wednesday, 21 November, from 6 pm to 7.30 pm at Lehmonkärki, Asikkala. The opening speeches will be given by Finnish Minister of Agriculture and Forestry Jari Leppä and Swedish Minister for Rural Affairs Sven-Erik Bucht. In the opening, Minister Leppä is expected to announce a new initiative to boost the role of forests in combating climate change. 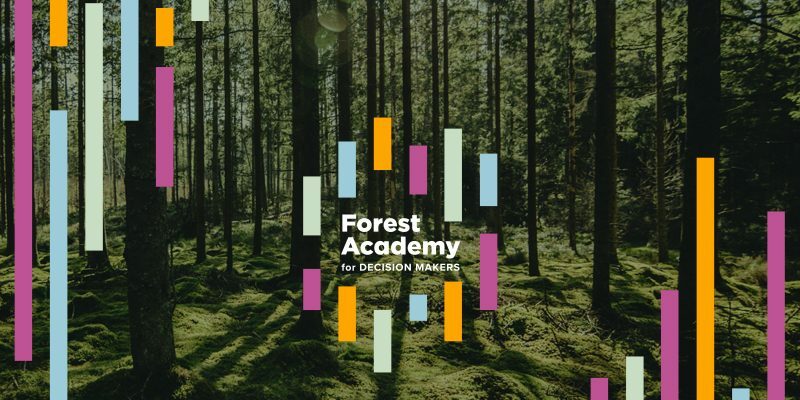 The Forest Academy for EU Decision Makers 2018 is a discussion forum on forests targeted to top-level decision makers in the EU. The event was convened by the Prime Ministers of Finland and Sweden and realised as a joint project by the forest sectors of the two countries. The Finnish Forest Association is in charge of the communication programme of the project, as well as of organizing the event. In Finland, the Forest Academy has been organized since 1996, and some 1,500 Finnish decision makers have attended it.